Watch out. There’s a pastor’s wife on the loose, and she’s wanted for the murder of an old high school friend. But she claims innocence. Yet while she attempts to discover who actually committed the crime, she puts herself in grave danger. Fortunately the experiences of this pastor’s wife are purely fictional, but the author who penned the new mystery novel from the perspective of the parsonage is 100-percent real. Carole Morden, wife of South Side Church of God pastor John Morden in St. Louis, Missouri, dared to practice what she preached to her small group and, as a result, saw her manuscript get published. 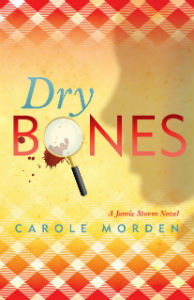 For ordering information, visit www.deepriverbooks.com/books/dry-bones-a-novel-by-carole-morden. Church of God clergy spouses are invited to attend a special breakfast during CHOG Convention 2015 on Tuesday, June 23, from 8:30 to 10:30 AM. Andy Thompson will serve as guest speaker, alongside hosts Maureen Lyon (wife of general director Jim Lyon) and Kim Grubbs (wife of Crossings Community Church pastor Marty Grubbs). Advance registration for the Clergy Spouse Breakfast is required, including a nominal fee of $10. Register by June 1 at https://cgm.formstack.com/forms/clergybrunch. Learn more about the Church of God at www.JesusIsTheSubject.org. This entry was posted in All Church of God, Central and tagged book, Carole Morden, clergy spouses, Missouri, mystery, novel, reading, South Side Church of God, St. Louis. Bookmark the permalink.